Looking For The Best Milk Frother﻿? Our team of experts have selected the Best Milk Frother out of hundreds of models! If you’ve ever had coffee or a latte or most other types of coffee, then you already know just how good a cup of coffee with frothed milk can be. Nothing tops off the perfect latte quite like some creamy frothed milk. However, if you go out and get your cup of coffee every time, I’m guessing you aren’t even aware of the fact that you can froth your own milk at home to top off your coffee and make the perfect latte, espresso, cappuccino or other type of coffee. There are a ton of products on the market that specifically deal with frothing milk for use at home on different coffee beverages. If you’re thinking that you need one of those devices in your life, then you’re here at the right place. This post is going to detail just about everything you need to know when it comes to buying a great milk frother for you to use at home. Right below, you’ll find a detailed guide explaining what you should be looking for in a milk frother and how you should consider which one to buy. Further below that is a list of ten of the top milk frothers we reviewed for your convenience. By time you’re through, you’ll have no problem finding the perfect milk frother. Now that you’ve decided you want to purchase a milk frother, it’s time to start thinking about which one you’re going to buy and why. The following is a detailed guide explaining how you should go about choosing which milk frother you should purchase. Essentially, there are two different types of milk frothers. There are jug style frothers and handheld frothers. Jug style frothers, as the name would suggest, are jug shaped devices that combine both steps of milk frothing into one simple step. 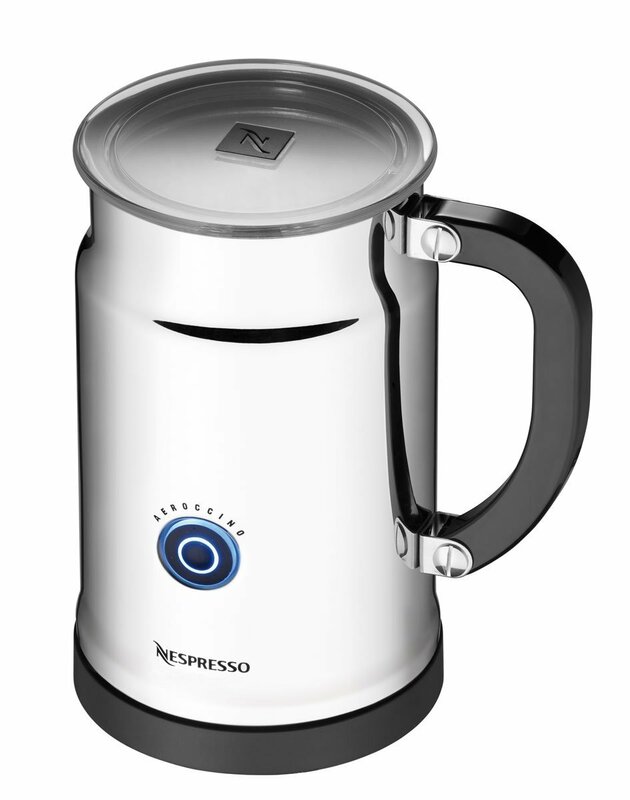 The jug style frother will both heat up and froth the milk at the same time, making the process simple and easy. With a handheld frother, you will have to heat up the milk on its own, and then use the handheld device to froth the milk. If you’re looking for the easiest way to do it, a jug style is the way to go and that is what will be reviewed in this post. There’s a lot to be said when it comes to the overall construction of the frothers that we’re going to be looking at below. Essentially, each frother is going to do the same thing except for a few that will have a better quality froth. However, some are going to last longer than others and that all comes down to how well it is built. You should try and look for a frother that is made of stainless steel so that you know it is strong and durable and will last a long time. Additionally, the comfort of the frother in your hand should play a big factor as well as how easy it is to use. While frothing is the main feature that each one of these products is going to do, it’s important to pay attention to some of the other features that you’re going to get when you buy a milk frother. For example, you’ll find some frothers that include extra features you’ll find useful such as temperature control and minimum and maximum fill indicators. Lastly, you should try and pay close attention to the power supply required by the frother as that can seriously impact your decision. Lastly, the price of the milk frother is probably going to play a large part in your decision regarding which one you’re going to buy. The products reviewed below have a wide range in price so it might be good for you to figure out what you’re looking to spend and then try and find a frother in that range. Typically, handheld frothers are going to be the cheapest option of the two. Much like anything else, it’s important to note that just because something is the most expensive, doesn’t mean it’s going to be the best option. Product uses induction heating, easy cleaning. The first product that is reviewed here is a milk frother from Nespresso and it packs in a ton of features that help make it one of the easiest milk frothers that you can use thanks to its simple design. 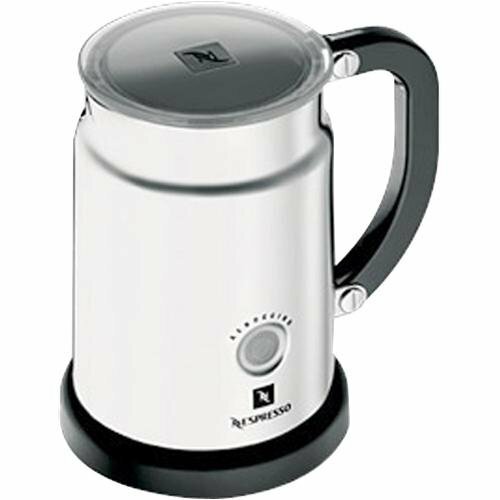 It comes with a simple one touch operation so that you can easily create hot milk froth or cold milk froth at the push of a button. Simply hold down the button for one second to get hot froth and hold it down for 2 seconds in order to get cold froth. This milk frother is constructed from stainless steel and includes black plastic accents to help provide a great looking frother for you to use. This frother works to quickly heat up milk anywhere between 160 to 170 degrees Fahrenheit. The slimline base makes it easy for you to fit this frother anywhere and the automatic shut off ensures you won’t have to risk any accidents due to leaving the frother on. 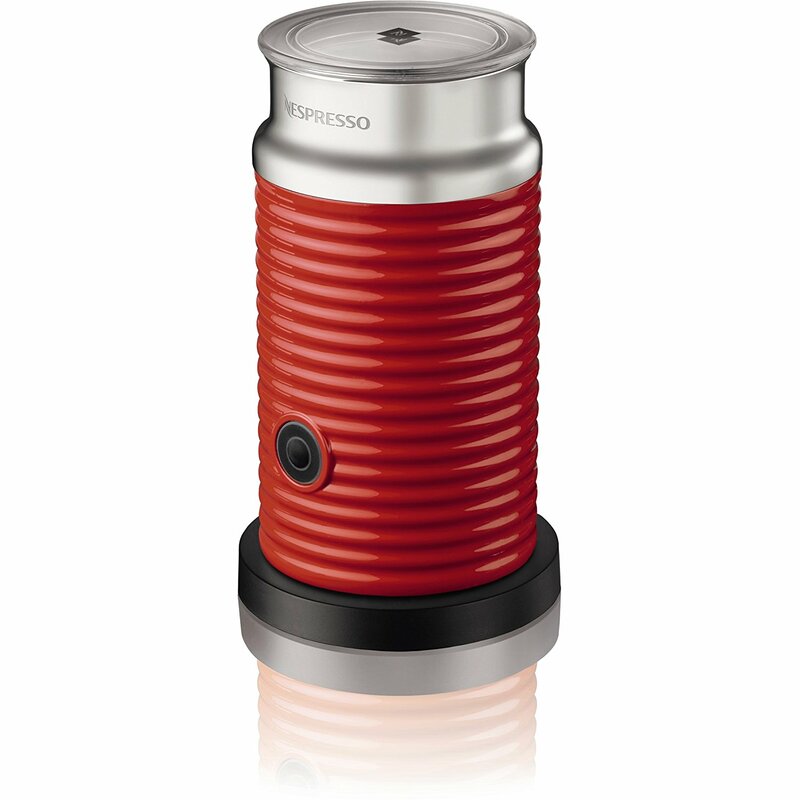 It is available in red, white and black and has a maximum capacity of just 4 ounces of milk before frothing. 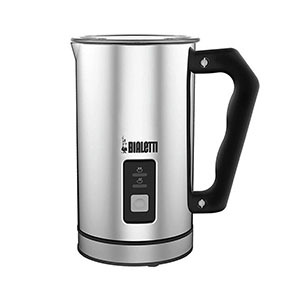 If you’re just using this device in order to heat up the milk and not froth it, then you have a maximum capacity of 8 ounces instead of the 4 ounces you have before frothing. If you’re looking to find a milk frother that offers a quick way to warm up the milk and froth it, then this frother might be the answer to your problems. It comes with three different option settings so that you can quickly and easily choose which one works best for you and what you want to do. You can just froth and warm the milk, froth the milk that is already in there cold, or you can just warm up the milk. On the outside of the frother, the beautiful high polish stainless steel finish looks great no matter where you’re planning on using it.This particular frother is electric and can go from cold milk to hot milk in a matter of just seconds. When you go to use this frother, you’ll need to set the main pitcher on the base in order for the milk to warm up. Once it is finished, you can easily detach the frother from the base and bring the pitcher with you wherever you need to take it. On the inside of this frother, you’ll find a nonstick interior that helps to provide you with an easy and simple cleanup whenever you use it. If you use the low frothing setting, then you can add 8 ounce of milk to this frother, but if you use the high forthing setting, you should only add 4 ounces of milk. Similar to the frother that was reviewed above this one, this is a frother that is designed to sit on a base when it is in use then detaches when it is finished frothing so you can pour from this container whenever you need to without having a cord in the way. 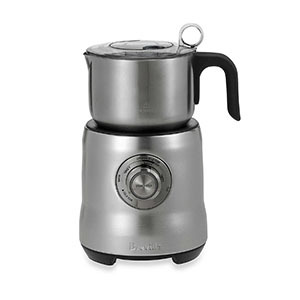 It comes with a motor and frothing and heating whisk and it is incredibly easy to clean if necessary. 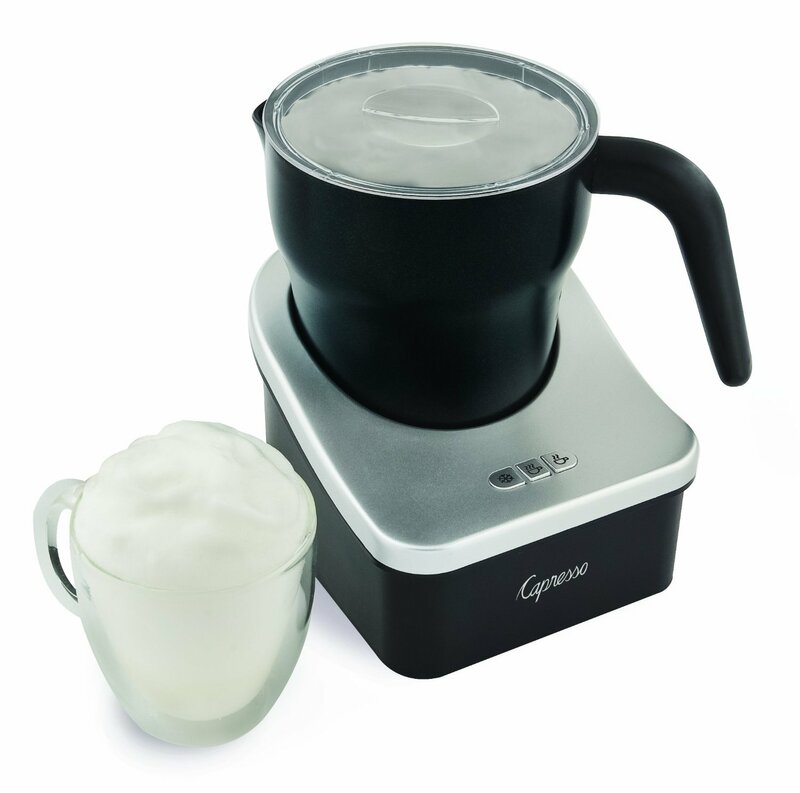 This machine makes hot and cold milk froth for cappuccino and can make hot milk for a latte. The capacity of this frother depends on what you are going to use it for. As an example, the maximum capacity for just warming up the milk is 8 ounces, but if you are warming up the milk and frothing it, then the maximum capacity is only 4 ounces since the froth is going to expand. In addition to the features discussed above, this frother has plenty of other extra features that are sure to give you what you want. It gives you both minimum and maximum line indicators so that you know exactly where you should pour to every time you use it. The pitcher is made with stainless steel construction and has vacuum insulation. This product is built to North American electrical standards and comes standard with a two-year warranty. 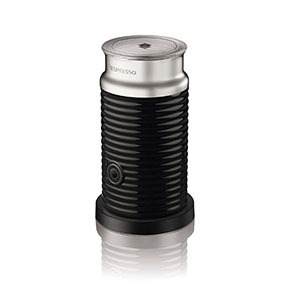 Similar to the first milk frother that was reviewed, this is another one that is made by the Nespresso brand and is another simple to use milk frother that is capable of frothing cold milk, frothing and warming milk, or just warming up milk. The process of frothing using this frother is fully automatic and it creates a light and creamy milk froth in just 50 seconds. This is one of the easiest milk frothers to use as you simply need to pour in the milk and then press the button and the frother is going to do all of the work for you. This frother is both compact and quiet so you can really take it with you wherever you may need to go. If you don’t want to froth the milk, it can simply heat the milk to be used in a latte if you want it to. Lastly, this frother is the perfect choice if you’re looking for a simple to use frother at home to enjoy with your morning cup of coffee or anything else you may wish to add the milk to. This unit is electric and can easily stay on your counter due to its small size that is only 7.9 inches by 6 inches by 6 inches. If you’re looking to find a simple and easy to use frother that is capable of heating up your milk really fast, this frother is well worth a look from you. This particular frother is capable of creating hot or cold creamy milk froth that can be used in cappuccinos, lattes or hot chocolate to help give it a great taste. The simple controls on this unit use only one-touch in order to start the frothing process so that you can work this frother with little to no previous knowledge of frothing. The easy clean design means that cleanup is a breeze whenever you use it and the detachable 360 degree swivel means that you’ll have no problem detaching the pitcher when you want to pour the froth into a cup somewhere. 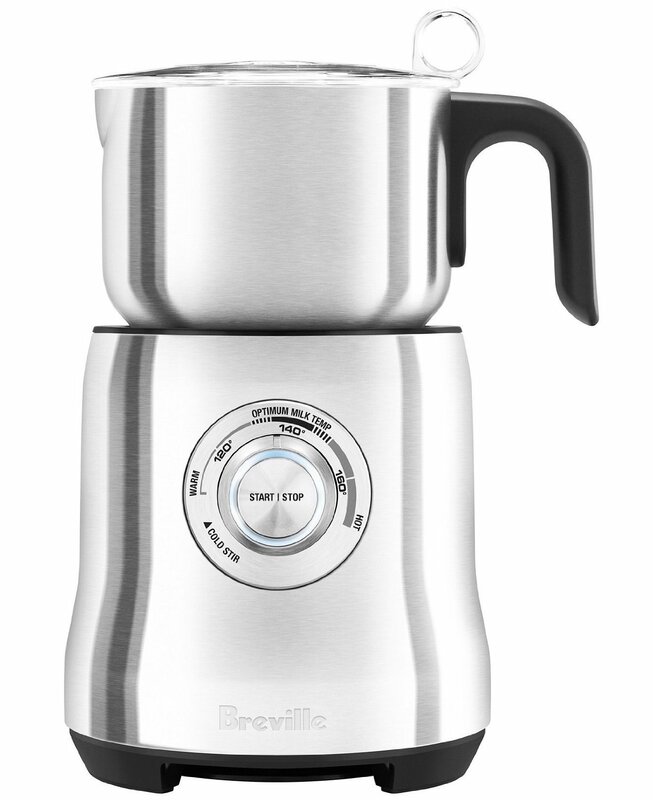 The sleek and incredibly durable stainless steel finish helps provide you with a great looking frother and the 500-watt heating elements means that it can rapidly warmup milk whenever you use it. The handle of the pitcher is heat resistant, you can pour it immediately after it is finished. Lastly, this frother has a capacity of about 16 ounces when you are just heating up the milk. It you are heating up the milk and frothing it, then you should only put about 8 ounces of milk inside the frother. If you want to froth your milk but also have control over exactly how it turns out and what temperature the milk comes out at, then this frother is going to be perfect. 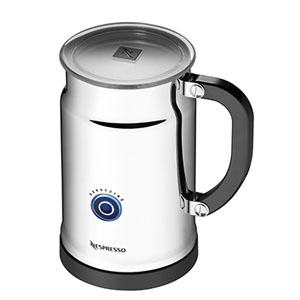 It comes with two frothing discs and 1 heating disc to make sure that the temperature of the milk is right and it creates the perfect froth every time. In case you want your milk to come out at different temperatures, there are three different temperature settings so that you can choose exactly how hot you want the milk to be when it is finished. Just in case you happen to forget about the frother, it comes with an auto shutoff feature to protect against any accidents. The large capacity of this frother helps make sure you can froth a lot of milk at once and the inside of the pitcher is both scratch resistant and non-stick so you can easily clean the frother when you’re finished. The stay cool handle allows you to pour the froth immediately after it is done heating and the see through lid makes sure that you can see exactly what is happening throughout the entire process. This particular frother is easily one of the weirdest and most unique looking frothers on the list but it also provides you with everything you need in order to effectively froth milk for any occasion. The latte frothing disc on this machine helps provide you with smooth and silky milk froth and the cappuccino frothing disc is great for making thick and creamy froth. Lastly, the hot chocolate maker can be used by simply adding in the chocolate powder or syrup to the warming milk.When looking at the actual machine, you’ll see that there is on-board storage for all of the different discs that you’re going to need to have with you. 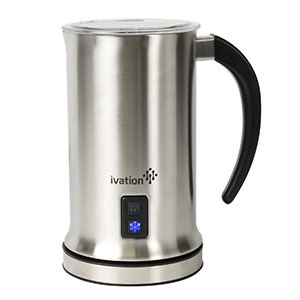 Additionally, you’ll love knowing that this product uses induction heating in order to heat up the milk and create the froth. This means that when you are finished with using the frother, you can easily place the jug in the dishwasher to clean the product with ease. This frother is a great choice whether you’re the only person using it or there are other people in your family that are going to use it as well. You can warm up anywhere from one cup for yourself to three cups for others in your family. After adding the milk, you simply select what temperature you want it to heat up to and push start. In no time, your froth will be done and ready to go! This is now the third different Nespresso machine reviewed on this post (with a fourth one coming up), so it’s easy to see exactly why the Nespresso brand is so highly recommended. This particular frother has one of the smaller capacities out of all the frothers reviewed but it is still effective at all times. 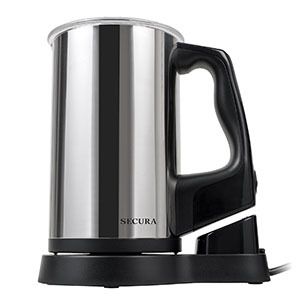 It has a capacity of around 4 ounces if you plan on frothing the milk and a capacity of around 8 ounces if you plan to just warm the milk without frothing it. This frother is capable of frothing both hot and cold milk so that you can choose exactly what you want to do with the frother. Even if you don’t want to froth the milk, you can still use this machine to just warm it up. It features plenty of additional features to help make your experience that much more enjoyable when you use this frother. The maximum and minimum line indicators help make sure that you always know where you’re filling the frother at so you don’t overfill it on accident.You can heat milk with froth in just 70 seconds using this frother and the detachable base helps make it easy for you to quickly and easily pour the froth once is is finished warming up. This is now the fourth product reviewed from the Nespresso company and this is definitely the most intricate product out for the entire post. If you think that frothing your milk is a great idea but you don’t want to have to worry about making the froth and not knowing what to do with it, this product is a great choice for you. 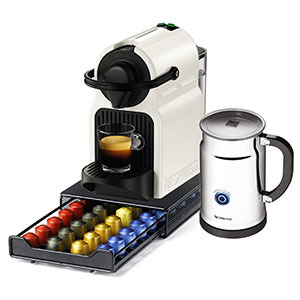 This bundle includes an espresso maker machine, a milk frother and storage drawer for you to store coffee pods in.The espresso machine helps ensure that you get the perfect amount of espresso each and every time thanks to the precise volume control that you can use to get the right amount without any waste. It takes just 25 seconds for you to get a great tasting cup of coffee or espresso each time you use the machine and it will automatically turn off if you haven’t used it in nine minutes. 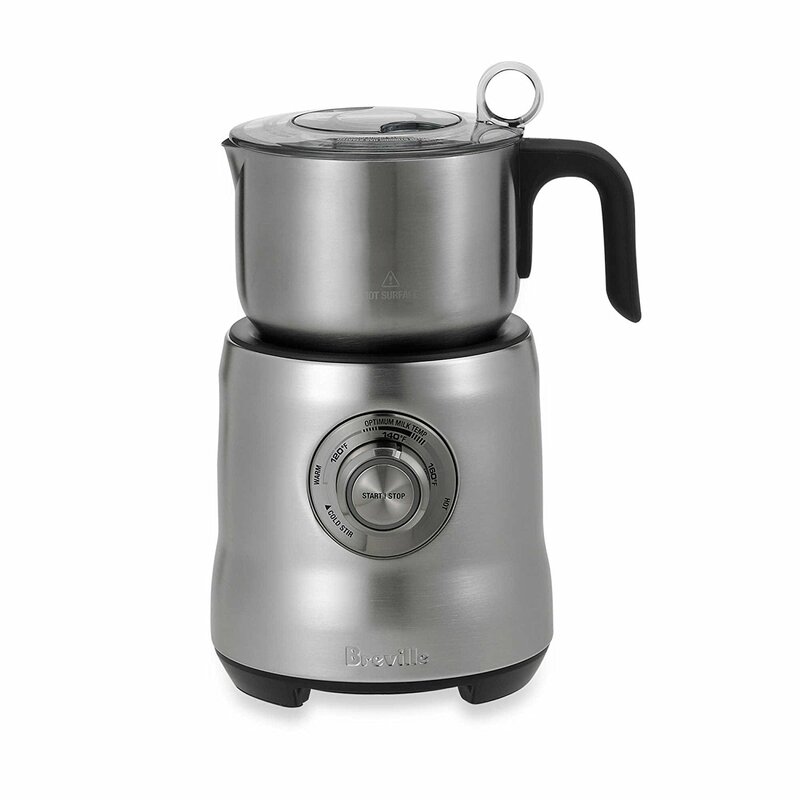 Since you’ll be making espressos on your own, it also includes a pretty great milk frother so that you can easily add it to your coffee or espresso to make sure that you get the desired results you want every time you use this espresso machine with the included milk frother. 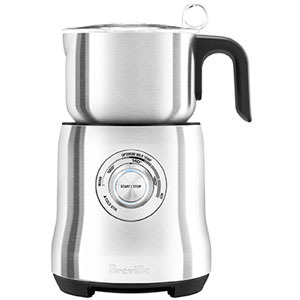 Another milk frother from Breville, this is one of the better milk frothers that you can purchase because it offers so many features to help improve your overall experience when you go to use this frother. There are a couple different frothing discs for you to choose from so that you can get the right frothing consistency depending on what you want your froth to end up like. The latte disc will provide you with a creamy froth while the cappuccino disc will provide a thicker froth.You can fill this frother with however much milk you want because it has a large capacity of up to three cups. Once you add in the milk, just select your desired temperature and then click the start button and you’re ready to go! Once the desired temperature is reached, this frother will automatically begin to froth and then turn itself off when it is done. Once you are completely finished with the frother, the jug can easily be placed in the dishwasher to be cleaned before it’s next use. Having a great milk frother in your home is a great way to really enhance your morning cup of coffee. You can get coffee shop quality froth without having to spend the crazy coffee shop prices every day. Having your own frother helps make sure that you enjoy each and every cup of coffee you drink while also saving yourself money from not going out. Milk frothers are somewhat expensive but after you stop buying your coffee out, you will easily begin to save money thanks to this purchase. If you’re looking to buy one of these, then I strongly suggest checking out the products reviewed above to find a great one that is sure to fit your needs.